AXANAR FINANCIALS and FUTURE PLANS…plus YOUR chance to ASK ALEC PETERS! And now the moment you’ve all been waiting for! (Well, at least some of you were probably waiting for it.) AXANAR PRODUCTIONS is finally answering that oft-asked question: what the heck did you spend $1.4 million on??? Obviously, it wasn’t all tires and sushi! But did it really all go to turning a warehouse into a studio, building some sets, fulfilling a few (thousand) perks, and filming a 4-minute Vulcan scene plus 15 minutes of other visual effects? Well, now you can finally find out for yourself. Axanar has also released an update on its plans for the future–what the now 30-minute Axanar movie will look like, how the full Axanar story will manage to get told, what’s going to happen to Industry Studios, and whether Axanar Productions will be producing other Star Trek fan films after Axanar (and will they be following the guidelines…well, of course they will!). There’s a full DONOR MEMO that’s been published on the Axanar website with the headline “Lay in a course for the future.” I encourage you to read it in its entirety. Here on Fan Film Factor, I am just going to present some of my own insights on those announcement plus a screen cap of the financials themselves at the end. Questions must pertain to the contents of the donor memo: the Axanar financials and the plans for the future. Questions about the lawsuit and what happened in the past just aren’t relevant to the topic(s) at hand. Not every question will be selected to give to Alec. Rest assured that I’m not just going to cherry pick the “easy” ones, but I am going to pick the best ones that I think will give us all the most important information and clarifications. Don’t be a jerk. Your question has a MUCH better chance of making it into the “finals” if you’re polite and don’t treat Alec like a swindler, con-man, liar, and rogue. Post your question(s) in the comments section below, and in a few weeks, I’ll publish Alec’s answers to the questions that I select. The mockumentary style of Prelude to Axanar actually made for a pretty dynamic storytelling format (hey, nearly three million YouTube viewers can’t be wrong!). And just like Star Wars began with “Episode 4,” Axanar‘s first offering was “PART III” of The Four Years War “documentary.” So now that the team has been granted two 15-minute fan films, the decision has been made to now create “PART IV” and “PART V.” These two films will tell the story of the Battle of Axanar and the peace that followed. But what about the rest of the Axanar story??? Fans wanted to see a 90-100 movie drama with a script that was supposed to rock their quadrant! Well, unfortunately, the Organians raided the game…or rather, the studios did. Axanar simply cannot be told as a full-length dramatic movie feature. That was one of the main terms of the settlement. A complete, trans-media production, produced in a variety of forms including the two 15-minute films, an audio drama of the full script, a complete illustrated script with production art, story boards and graphics, and written fiction to fill in the gaps in this amazing story. So if you’re an Axanerd like me, even though you won’t get a full-length feature film, you’ll still have a LOT to keep you entertained and your inner (or outer) geek satisfied…including a full-length audio drama, which is still pretty cool if it includes real actors. Apparently it WON’T be one-and-done (or two-and-done) after all for the Axanar team. With a full studio available, Axanar Productions does, in fact, intend to continue making fan films beyond Axanar…and not just Star Trek fan films! That’s changing. Industry Studios has now announced that it will be operating as a non-profit business and will be filing paperwork shortly to get 501(c)(3) tax-exempt charity status. Please note that you can operate as a non-profit without necessarily being a 501(c)(3). Some fans haven’t seemed to have understood previously that non-profit and tax-exempt are two separate things. The difference is that having the official 501(c)(3) designation means you are both exempt from paying taxes and also that charitable donations to you are tax-deductible for the donor. (I’d love it if I could declare my contributions to Industry Studios on my taxes! Wouldn’t you?) Being non-profit, while required in order to be tax-exempt, simply means you put your revenue back into the endeavor itself and the people working for it. …assisting other independent, fan and student film makers in bringing their projects to the screen. It is our desire to provide low-cost production services to other filmmakers like us; helping them to get their projects off the ground and into the hands of consumers looking for fresh, high-quality entertainment in the sci-fi, horror and fantasy genres. Although Axanar Productions is precluded from using Kickstarter or Indiegogo to raise any more money for shooting the Axanar fan film, Industry Studios is now a completely separate legal entity. Axanar Productions will use Industry Studios to film in, but so will other productions and student and professional filmmakers. As such, the continuing expenses for Industry Studios, at least for the time being, can, in fact, be crowd-sourced. And that’s important because, right now, the studio is costing $$15,000/month in rent and utilities plus another $3,000 for monthly storage of the Axanar sets during time when other productions want to use the facility. Obviously, the ultimate goal is to bring in more commercial productions to rent the studio and also offer discounted rates to students and other low-budget productions that can’t afford the higher rents of other comparable L.A. studios. But for now, the campaign will try to raise money for the interim few months while the 501(c)(3) application is processed and marketing efforts are made to bring in business. Just so you know, there were roughly 2,800 separate receipts, entries of individual payments, invoices, statements, and other financial records and contracts that had to be poured over and examined by the Financial Review Committee. This was the job of the three-member committee. They were brought on to go through nearly three thousand individual payments and decide if these were reasonable expenses or if something fishy was going on. (And yes, that’s an intentional sushi pun, folks.) They were not looking to simply rubber-stamp all the expenses. Despite being Axanar supporters, they are also all people who work in the entertainment and financial industry. Their peers could easily look at this financial review and, if they see wild inaccuracies in what these three men have signed their names to, this kind of sloppiness could reflect poorly on each of them professionally. That is why the committee took such a long time. If fact, the length of time it took them surprised many of us “on the inside” (like me!) because I actually was more expecting a “Hmmm, looks good to me…” kind of review. At least at first. Then I discovered exactly how carefully these three men were going through everything and how seriously they were taking this project. Having viewed the spreadsheets personally–with eyes glazing over after looking at just a few hundred line items–I have to say with all sincerity that I have true respect and admiration for all of these three men for going so meticulously through thousands! And note that it is, indeed, a summary. A decision was made (and I think rightly so) not to provide all 2,800 line items because, to be honest, that was the committee’s job to go through with a fine-tooth comb. It doesn’t make sense to open up the flood gates to criticisms of “You spent way too much on screws!! !” or “That seems pretty expensive for advertising…what do you have to advertise anyway?? ?” There’s work to do now, and arguing line items with detractors is a real waste of time. After independent and committee review, we the undersigned, given our professional combined experience of over forty years in the fields of finance, producing media across multiple platforms, and physical production, can and do attest that the numbers presented to us by Axanar Productions, accurately reflect, within an acceptable margin, the cost of what it would take to: 1) Lease and retrofit a building to make a viable sound stage, 2) Mount a production (pre-prod and one day of shooting) up to the point at which the production of the Axanar production was halted, 3) Donor fulfillment cost as of 2016 including items and postage, 4) Promotions. And now, I invite those with questions for Alec Peters to ask them below. And once again, I respectfully ask that you try–please try–to keep your questions civil and polite…especially if you truly want an answer. If you just want to insult Alec, please do it elsewhere. I do want everyone to see this website called writers guild of america west Look for the BASIC AGREEMENT OF writers guild of america west. I want everyone to read this pdf of the writers guild of america west ok please you will fine out why cbs and paramount studio want them to go by. It’s 687 pages long, dude! I am NOT reading it all. Can you please copy-paste the part you’re talking about? What sorts of things are left to be completed as far as set building and such? Are things pretty much ready to go or is there substantial work left to do? Additionally, were there any things built that now can’t be included in the filming due to the change of format from a full length movie to the CBS approved run time? If there are things built that can’t be included, are they going to be scrapped or held for future projects? Finally, are the studio assets in place or are more things required for the studio to function? Thanks for sticking it out so that we can have good stories. As far as I’m concerned you folks have made the most of a horrible situation. Damn! Awesome questions there, Justin. I wanna know those answers, too! The one question I do have is regarding what was labeled as a $38,000 salary in the Dec. ’15 report. Is that money accounted for here? Asking the tough questions is one thing, getting the actual answer is another one ! HubcapDave came through on his end, let’s see if Alec can answer the question without blowing bubbles out his A-S.
Well, that was certainly helpful. A very excellent question, Dave. Kind of hard to tell who got paid what when there isn’t even a separate category for Wages, a pretty standard line item for most businesses. Will there be some sort of dedication and/or nod to the late Richard Hatch included in the final film? How will you adapt the story to compensate for the absence of Kharn, assuming of course (just for argument’s sake) that you don’t plan recasting him? Alec are any of the three professional actors you’re allowed to use, coming back? Are you still playing Garth? If the professional level actors have any sense they’d avoid this mess like the plauge ! As for Garth, try getting Alec to give up his lifetime dream (even buying the uniform) of playing the part, you’d have better luck finding gold nuggets in your toilet than Peters giving up the part! Of course the Axanar film has to actual move forward for any of this to even become an issue, hold your breath for that to happen ! My question: What are Alec’s ability and plans to produce the 30 minute film and any other promised content (audio drama, illustrated scripts, etc) if no further funding or insignificant amounts of funding is forthcoming? What is the fall back strategy. Since pre-production activities are back on…what is the current estimated funding requirements to produce the 30 minutes of film, extra content and delivery of rewards to backers. i.e. what is the amount that is estimated to be still be needed from the backer community that Axanar Productions and related companies will be asking for. The amount of work required now is probably the same as it was the first day the fundraising began, little to nothing done ! As for the funds required, 1.5 million dollars is nothing this time, we need over 2 million this round and half the supporters have smartened up and moved on ! So, to answer your question, mortgage your home, sell your vehicles, cash out your bonds and savings and send it all to Alec Peters – and hurry, him and crysstal have another trip to Florida coming up soon ! Wow, Anthony…read the room, dude. You’re the only one making a fool of yourself on this page, and you’re doing it over and over and over and over again. Do you just not want to be an adult? It’s fine if you don’t, but then please just be an immature, petulant child on someone else’s blog. The grown-ups are trying to have a mature conversation. Will Alec publish a breakdown of the estimated funding still required. Alec don’t have time in his valuable day to break down every little expense, he’s got breakfast to eat at Marlo’s, on the donor’s dime of course ! Then after breakfast he has to drive to the warehouse and set behind the desk (with nothing to do) for a couple of hours and then head to lunch with Crysstal, again on the donors money, and then back to his apartment for meditation – and then repeat the procedure for the next day ! Alec is a busy guy, and that don’t even count the fifteen minutes he gives to his supporters to shake money from them ! My question for Alec is what is next for industry studios after Axanar? Have you been approached by other fan productions? Alec has been researching the possibilities with an audio presentation of Axanar and it’s doable, he feels between him, Robert and Reece they have the fire power to actually pull this off in Peters apartment! It’s going to be a bold adventure, but hold on ! As for Industry Studios (or we call it: “the bottomless pit”) nothing new there, just buying time for another 9 months and then it’s over ! But, we still need all the suckers (I mean donor friends) to cough up as much money as they can, this empty promise to the supporters must continue until the last door lock has been changed by the landlord! Since Alec has reportedly been covering the studio rental and any other costs himself…will any potential forthcoming public funding be going to Alec Peters directly to reimburse him for these (or any other) incurred costs. I mean aside from any funding required for film and content production. Man, you all are providing some awesome questions. I was expecting to be flooded with snarky accusation-type questions from detractors (and those might still be coming), but so far, I love what I’m seeing. Thanks, everyone! There’s only one small problem with reimbursement, you’ve heard the saying “robbing Peter to pay Paul” – well that summons this up ! Alec used the old shuffle technique, used other peoples money intended for business to pay himself and then loan that money back to the business and claiming it as a personal loan to the business – in the investment world this method will get you 20 years in jail ! But since all the funds are gone now, or at least all that’s ever going to be known, everything else is pointless. Well, obviously not, as the financials show. Why do you keep embarrassing yourself, Anthony? Possibly…although I’ve seldom seen the ignoring of bullies work as a deterrent. What are the total dollar amounts of donor money that went into Alec’s (or Propworx’s) bank accounts before Axanar opened it’s own account in 2015? Have those funds been transferred to Axanar or are they still in Alec’s account? Where are the funds raised outside of KS, IGG, and the Donor Store – like selling t shirts, posters, and other merch at cons? What is the total amount of checks written to Alec Peters from Axanar and what were they for? Did Diana Kingbury ever get paid and how much? Are there any other shareholders of Axanar or Industry Studios? Who are they, what % do they own, and what did they pay/do to earn that equity? Just wanted to say that there’s really no reason to ask Alec this particular question because there are obviously no funds still in any account. The financial summary shows all moneys to have been spent on legitimate expenses. Some of your other questions might make the final cut, though. My son loves Alec, Jo! He let Jayden sit in the captain’s chair and play on the bridge and even gave him a toy to keep (something that was sitting on Alec’s desk that Jayden had started playing with during one of our visits). Jayden still has that little racing car. Jayden is convinced that Alec is building the actual starship Enterprise (I tried to explain that it was the USS Ares), and he loves visiting the studio. He had a blast sorting patches for the perk-packaging “party” we had back in July of 2015. Now there’s offices, a six-layer sound-absorbing studio floor suitable for bracing sets to, a green screen wall the size of a basketball court, special tract lighting and a powerful electrical grid, state of the art digital editing hardware and software, and a host of other useful resources. The only thing still left to do is complete the sound-proofing, although the studio is still pretty sound-proofed with the floor and those tremendous elephant doors they built to cover up the noisy sliding metal door at the back loading dock. 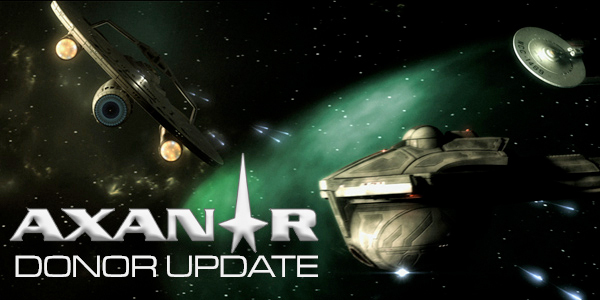 The fact is that, no matter what headwinds have hit over the past 14 months, Axanar is still the uber-cool fan project that I fell in love with. And not just for us donors, bit for the “children” as well. And I’m not just talking about my six-year-old son. Part of Industry Studios’ ongoing mission will be to help young producers create their projects. Student filmmakers will be able to use the resources of Industry Studios at a fraction of the cost of other facilities. Heck, maybe Jayden will someday be one of those film school students! I have a friend who was also an Axanar donor who has three children (the older two already teenagers), and the middle child is getting interested in film-making. 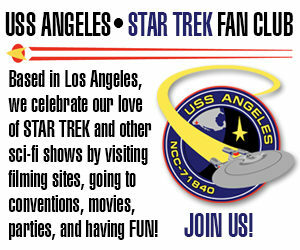 Axanar Productions intends to use volunteers. What a great way for my friend’s son to get some hands-on experience on an actual set in a real studio. In fact, in a few years, my own son Jayden might be old enough to help out, too. How awesome would that be? If that wasn’t so long I’d want it on a t-shirt. Wait so Jona than are you admitting that Axanar used illegal, unpaid workers, including an underage one? Since Axanar Productions is registered as a for profit corporation any work performed for them must be paid and things like child labor laws must be followed. You cannot donate time to a for profit company and whether Axanar produced a profit or bit it is registered as a for profit company. Buying a warehouse and building a studio is blowing the money. The fact that you can’t see that is weird. That money was donated to produce a film that could have continued production during the lawsuit, but for some mysterious reason no one wants give and/or explain properly it didn’t. If you really want to ask Alec questions and play journalist then find out why he stopped production because to me stopping suggests that the production was never the goal. That’s been explained elsewhere, but maybe you missed it, Ronald. Once Winston & Strawn were brought on board, they strongly recommended to Alec that all production be suspended until the lawsuit was either settled (in which case they would receive guidance on what they could and could not do) or resolved with a verdict. Continuing production would place Alec at greater risk for an expanded lawsuit (or a second one), since the full Axanar feature would be considered a separate incidence of alleged infringement. And unlike “Prelude,” for which there was a basis for a fair use defense (until the judge nixed it 11 months later) because of the transformative nature of the mockumentary format, a dramatic format feature film would not fall under the same transformative classification. Also, it would be MUCH harder to argue for non-willful infringement if Alec made a SECOND full fan film WHILE getting sued for the first one! I hope that makes sense, Ronald, and clears up the mystery for you. The decision to suspend production was made–very wisely–on advice of legal counsel. Ronald, are you high? It’s been explained ad nauseum that W&S advised them to NOT MAKE the movie they were getting sued over while the suit is going on. Be kinda stupid to get a high-powered IP litigation firm, and then ignore their advice, don’tcha think? Furthermore, let’s stop pretending that following advice of council is somehow NOT a legitimate reason, m’kay? You know, I was going to respond to this, but I think I’m better off just saying “what Jonathan said”! Sorry, where did they do that? In the memo to donors, they said it was Axanar Production that was doing that. Let me double check that, Fred. I’ll post a correction if I need to. Here is a few questions I think everyone has the right to know in the interests of transparency. 1, You say you never too a salary crom Axadonations however in the 2015 financial statement it says differently. 2, If these new figures are to be believed can you clarify in what sections the salaries/money paid to both Dianna and Robert can be found. 4, Is the studio complete now with all safety aspects up to code and of not how much is this going to cost to complete? Because no accounting is complete unless you account for all your et ceteras! 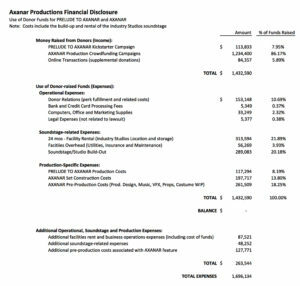 Then this document is not a complete breakdown of the money that has gone in and out out Axanar Productions and all of it’s subsidiaries and is simply notworth the paper it’s printed on so to speak. Yes I am a vocal critic or “hater” depending on what word is used this week but in the interests of transparency which is something that is blasted out by Alec over and over, this financial statement is worse that the last one at least the last one has some sort of breakdown. You literally asked for a complete accounting of et ceteras, Hams. And, let’s be honest, no matter what Alec issued, there was always going to be some kind of criticism (justified or otherwise) coming from your camp. It’s actually to the point where if Alec walked on water, there’d be people on that side saying that he can’t swim. This release doesn’t match Alec’s statement that Axanar is the most transparent fan film. Numbers on a page with no evidence to back them reviewed by people who are not independent of the production mean nothING and certainly don’t qualify as transparency. 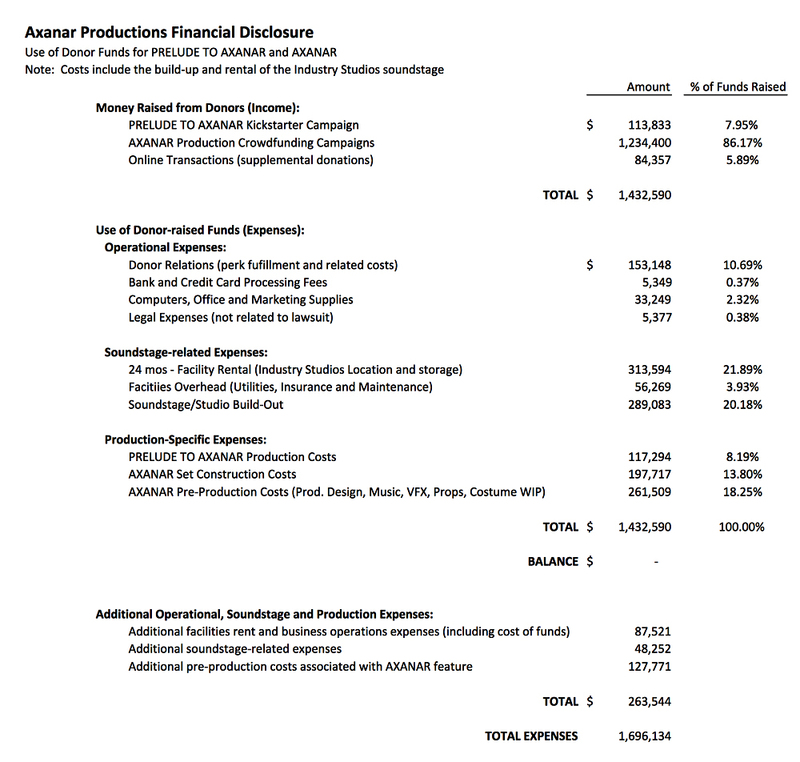 I’d like to know if there’s a production out there that’s released more financial information than Axanar. Beyond STC’s tax filings (required to keep his 501c3 status), I don’t know of anyone else who’s produced anything. So please, people making issue of this, why don’t you show us instead all the other productions who have made any of their financials public at all? Give us what production you think should be the benchmark, and why they should be the benchmark, and what they’ve shown of their financials to become that benchmark in your minds? Will, you be able to use the “Heavy Cruiser” introduced at the end Prelude in the new film? Being the same style of ship as the Enterprise, did the settlement take that off the table? I know that includes something pertaining to the settlement but it also looked like this would be a big part of the Axanar film. When the audio drama is finished, will donors get a downloadable mp3 version or anything like that? I’m very intrigued about the prospect of fleshing out the story of Axanar in different media formats, particularly in audio. One of my favourite sci-fi ‘entities’ is Journey Into Space, a hugely popular radio drama which attracted an audience of millions and was translated into multiple languages. I never heard this show in its original run (I’m only 30), so when I hear it and create the images for what I’m hearing visual sci-fi like Star Trek, which of course came later, influences how I imagine space/space travel. Gripping sci-fi audio is possible, but Star Trek is best known for being presented in the visual medium. To my knowledge this has not really been done before, besides perhaps a few fan projects. What inspiration will you draw from to tell the best story possible in this format? blocked from newsletter, so I’ll just have to wait until someone posts it online. Would living up to your claim of the most transparent fan-film necessitate releasing the line item receipts for fans to conduct an audit themselves?? I second that. Also, may I have bank, credit card, PayPal, and Stripe statements for all accounts related to Axanar from 1/1/14 to the present? Don’t worry, Jonathan – my eyes won’t glaze over by reviewing the 2800 or so transactions, this is what I’ve been doing for a living for 25 years and I would relish pouring over Axanar’s books. I’ll even share what I find! Perhaps it would if you could show another fan production that has done the same…don’t worry, I’ll wait for you to find one…..
What was the point of paying yourself if you were going to put the money back in anyway? Aren’t you just leaving yourself open to criticism? Jonathan in your statement “don’t treat Alec like a swindler, con-man, liar, and rogue” I was astonished as to how well you actually defined him.. I noticed that several of my excellent and directly to the point questions were never posted, but I’m sure you’ve memorized them and will address them with Garth Peters . Also, I noticed that the transparency issue was mentioned, you know where Alec claimed to be stright forward about the disclosure of all the expenses and where the donor’s funds were being spent, whatever became of that ? Granted that we all have seen that half baked financial statement that he released several days ago and looks like something a twelve year old gives his teacher, but come on, this guy is 56 years old and should know some basic accounting skills ! If you gave Alec’s general ledger to an accountant he’d be laughing so hard he would probably piss himself ! Actually, I was quoting (mostly) the opening of “I, Mudd,” but I’m sure you’re just as happy with that comparison as you are comparing Alec to Garth. Enjoy. You’ll notice that I’ve approved the vast majority of your comments, Anthony. The ones that get deleted (mostly unread, I might add) are the ones where I notice either a swear word or a direct personal insult/name-calling against someone (usually Alec Peters). You were already warned, so for you, trashing is automatic. I begin reading your comments, and as soon as I see anything you were warned about, I just stop reading right there and and hit “trash.” It’s quite the time-saver! (That’s a quote from “The Trouble with Tribbles,” by the way. Mr. Peters: In the settlement, did Paramount (well, CBS I guess) apologize for what they did to Richard Hatch (and everyone who loved his character in Axanar). I think that is one of the outstanding tragedies of all this. Of course we can and will move forward, and the tenacity (driven by love of Trek) of the Axanar folks has really impressed me. To continue my thought above, are you interested in recasting Hatch’s character or maybe (crosses fingers!) you have recorded material laying around. I don’t see any point in this thread about asking Alec Peters the straightforward questions that fans would like, let alone, demand answers, too. The ONLY outcome of this thread will be the following. Alec will put a spin on the answers. Or to be more precise, he will lie in all of the answers that he will give. This thread will be treated a nothing more than a PR smokescreen to cover up how bad the situation REALLY is Star Trek – Axanar, and how it is nothing more than ‘damage control’. The VERY idea of fans still defending and supporting both Alec Peters and Axanar is a bad one. One that will only cause further damage to the reputation of Star Trek and it fan following. You used the Joe Wilson outburst? Really??? That behavior was so shameful that even Republicans condemned it. Ask me if I really care. Seriously, Alec Peters’ behavior was, and still is, so shameful, that he SHOULD NOT EVER be welcomed in ANY Star Trek related activity. His actions are certainly a bad reflection on the Star Trek fan community. Let alone his actions make him come off as a used car salesman. SMH. Really? It’s more like a tremendous tendency for ruining the good name of Star Trek and all of the positive things that it stands for.